Let me first start by saying that if there is a place in or near Canberra that looks more like my Grandmother’s lounge room than the Front Gallery in Lyneham, I’m yet to discover it. One step short of tacky, it is a charming little hole-in-the wall that smells like a bakery, the coffee is up there with some of the better stuff around and the girls behind the counter are cute and chirpy. Worth checking out if you’re in the neighbourhood. The place was comfortably crowded, just enough people to make it intimate – like a gathering of friends rather than a room full of strangers. Jack Biilmaan, former front man for Canberra reggae band The Second Hand Salmon, stepped into the limelight to warm us up. Jack is someone I would describe as a ‘cultured bogan’ – which I mean in the kindest sense – A very Aussie bloke who 100% embodies the Australian persona that we’re known for through culture generalising all over the world. 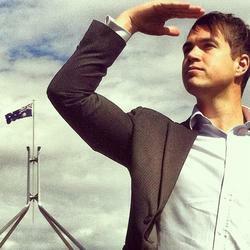 He is exactly the kindly, funny, uncensored Australian bloke that we hear so much about but so rarely see. The beauty of this being that from that rough, country boy came the sweetest voice and some of the most beautifully played blues/roots guitar I’ve heard. Starting us off with some absolutely beautiful music, whetting our appetite for the show to come, he graced us with some songs from The Salmon, a few originals and an awe-inspiring cover of ‘Grand Optimist’ by Dallas Green. After his performance I was mystified – I will definitely be attending more of his shows in the future. If you’re even a little intrigued, get down to Beach Burrito co this Thursday at 7:30 to hear this amazing paradox of sound vs man, and check out his Facebook page. Benjalu is usually a five piece band so the show was an acoustic set featuring the two boys Ben Gumbleton and Nick Saxon. Both boys were looking dapper in their button up winter coats, a mop of curly hair poking out under their caps. I can honestly say I wasn’t sure what to expect, even after Jack’s performance. 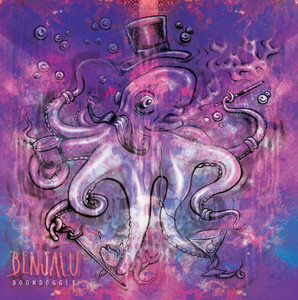 The last time I’d seen Benjalu was early 2008 at the Phoenix but I remember liking them enough to buy their $10 EP (a big decision for an 18 year old bartender). A pot came around asking for donations to keep them on the road, and both their most recent EP’s were available for purchase there as well. I popped $10 into the tub but I would have put in $100 if I’d known what I was about to witness. All at once I heard their guitars in sync and their amazing voices, perfectly complimenting each other’s in soothing harmonies and I was hooked – not ten seconds into their first song and I never wanted to hear the end of it. The absolute sincerity in every word tumbled through the speakers, every song speaking to me like they’d written it to me, about me or from me. The music was so beautiful, so charming and so fitting to the intimacy of The Front café and gallery that I was moved almost to tears. To be able to relate to a song (or many) so strongly, to me, is so important. The affect Benjalu’s indescribable acoustic performance had on me was profound. I was touched to hear so much love and respect for music, such an understanding of their audience and the impeccable delivery of their message. The stories between songs gave them a little extra depth, painting the picture a little clearer and giving the listener a taste of their experiences while traveling around Europe. There was also a beautiful tribute to Tracy Chapman with a six minute mixed medley including ‘Fast Car’ and ‘Baby Can I hold you Tonight’. For me, the absolute highlight of this performance was how lovely they were in person. I spoke to Saxon after the show while buying the EP’s (Boondoggle and The Battle) and told him I’d seen them play years ago, he said, “so we’re old friends then!” and gave me a cuddle. We both commented on how much the intimacy of the venue enhanced the great artistic vibe of the show and he said he was absolutely stoked by the way the whole thing panned out. If you love great music, get to Benjalu’s website and grab a copy of both EP’s, you won’t be disappointed. I loved every second of the performance and the EP’s are both excellent, particularly the songs ‘Little Darling’ off The Battle EP and ‘Boondoggle’ off the Boondoggle EP – I absolutely recommend getting to a show if you can, and I can’t wait for a full length album hopefully in the near future. That is the most accurate description of Jack Billmann that I’ve ever heard. Well articulated. I’ll be on the look out for more gigs by these artists.